﻿In Mary's world, there are simple truths. Now she must choose between her village and her future, between the one she loves and the one who loves her. And she must face the truth about the Forest of Hands and Teeth. Could there be life outside a world surrounded by so much death? 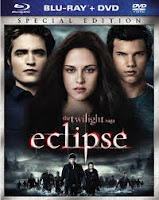 In the third chapter of Stephanie Meyer’s phenomenal Twilight series, Bella Swan is surrounded by danger as Seattle is hit by a string of murders and an evil vampire continues her quest for revenge. In the midst of it all, Bella is forced to choose between her love, Edward Cullen, and her friend, Jacob Black—knowing that her decision may ignite the ageless struggle between vampire and werewolf. Got Eclipse too! TFOHAT is awesome series. Nice books. Congradulations! You've received the Versatile Award! 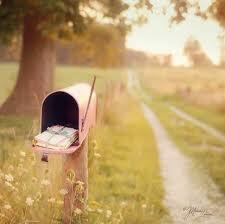 Congrats from Lulu at The Book Addict! 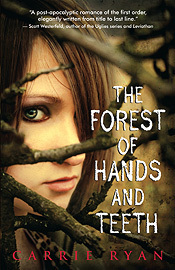 Wow, I loooove that cover of The Forest of Hands and Teeth. I haven't read either TFOHAT or Shiver yet, but I've heard amazing things about both, and I'll be looking out for your reviews so I know whether to read them or not. I'm afraid The Forest of Hands and Teeth would really freak me out but I've heard good things so I think I will give a shot soon.